Used Audi TT Review - 2015-present | What Car? What's the used Audi TT sports like? Remember that kid at school who was annoyingly good at everything? Top marks, brilliant at sports, the lead role in the school play and even a musical virtuoso? Well, that rather sums up what the Audi TT Roadster is like. Of course, mention a TT and lots of people will think immediately of the first-generation model, which became famous for its wonderfully geometric looks, beautiful interior and ultra-trendiness. This third-generation model is a natural evolution of that first groundbreaking car – one that is arguably less distinctive now that the rest of the world’s caught up, but which still looks stylish and feels just as high-quality – if not more so – than the original. There’s a wide selection of engines available, ranging from the cheapest 178bhp 1.8-litre turbo, right up to a potent 306bhp 2.0-litre turbo in the TT S; there’s even a 181bhp 2.0-litre diesel variant, should you wish to combine open-air motoring with high-mile fuel economy. The most popular engine of the lot, though, is the 227bhp 2.0-litre turbo, which offers a splendid balance of power and efficiency. All but the most powerful of these engines can be teamed with your choice of three trims. Sport is the most basic but still gets air conditioning, part-Alcantara seats and xenon headlights. S line, meanwhile, adds automatic LED headlights, automatic wipers, bigger wheels and a more aggressive bodykit, while Black Edition adds, as its name suggests, black styling accents. 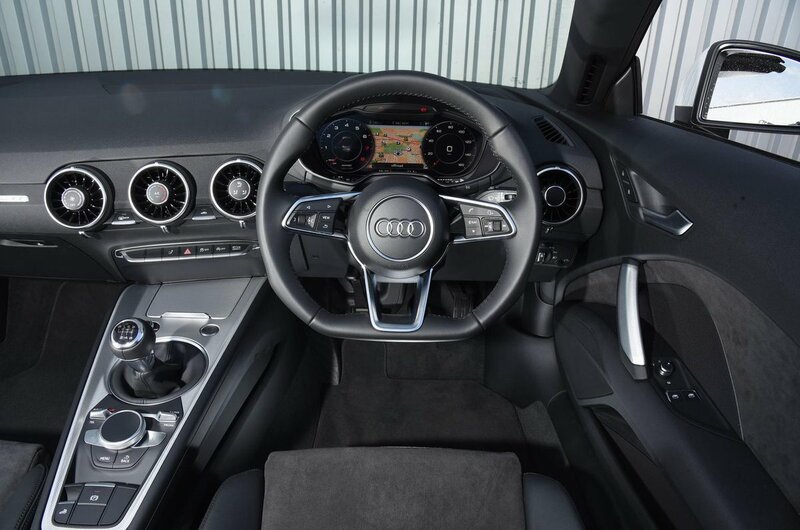 The TT S, meanwhile, features adaptive suspension, heated front seats and leather upholstery. Keep in mind, though, that none of these models gets sat-nav or climate control as standard; you have to pay extra for those. 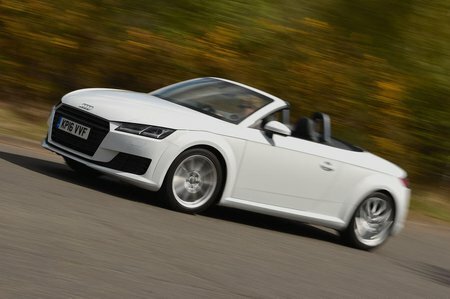 Whichever engine you plump for, you’ll find the TT is a delight to drive. The steering is crisp and precise, there’s plenty of grip and there isn’t a hint of lean from the body unless you really grab it by the scruff of the neck and throw it around. What’s more, if you choose one of the quattro four-wheel-drive models, you get immense traction away from the line, especially in more slippery conditions. True, the TT isn’t quite as exciting to drive as a Porsche Boxster, but it’s still great fun and very rewarding. Yet, for all its poise, the TT still manages to ride extremely well. It’s as firm as you’d expect from a sports car but never uncomfortable, making it perfectly usable both around town and on longer journeys. Of course, you get a little more wind and road noise than you would with the folding hard top of the BMW Z4, but not so much that it becomes intrusive. Inside, there’s the sort of beautiful interior we’ve come to expect from a TT. Large, round vents house the heating controls; there’s no central screen, because everything’s controlled using the beautiful Virtual Cockpit display – a huge TFT screen located where you’d normally find the dials that can be customised to give you all the information you want to see. It works beautifully and is easy to find your way around; the same goes for the rest of the interior, which is very well laid out and feels top notch in terms of quality. What’s more, there’s plenty of space for two people, a decent amount of space for their oddments and one of the largest boots you’ll find in any two-seat drop-top. It all adds up to a great all-round package.